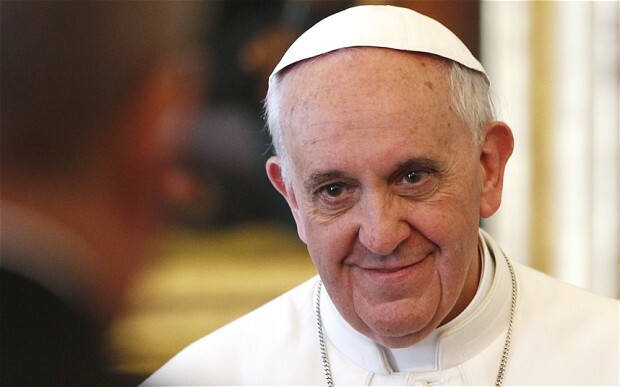 Having mentioned Pope Francis last week, let me revisit a homily he delivered back in May. John said to him, "Master, we saw someone who is not one of us driving out devils in your name, and because he was not one of us we tried to stop him." But Jesus said, "You must not stop him; no one who works a miracle in my name could soon afterwards speak evil of me. Anyone who is not against us is for us"
The Lord created us in His image and likeness, and we are the image of the Lord, and He does good and all of us have this commandment at heart: do good and do not do evil. All of us. "But, Father, he is not Catholic! He cannot do good." Yes, he can. He must. Not can: must! Because he has this commandment within him. Instead, this 'closing off’ that imagines that those outside, everyone, cannot do good is a wall that leads to war and also to what some people throughout history have conceived of: killing in the name of God. That we can kill in the name of God. And that, simply, is blasphemy. To say that you can kill in the name of God is blasphemy. Instead the Lord has created us in His image and likeness, and has given us this commandment in the depths of our heart: do good and do not do evil. The desire to see the good of all is not something that simply comes over us one morning; it comes through a long education of the heart and mind until we consciously and deliberately, day by day, moment by moment, make the effort to see Christ in the next individual we meet. Someone is probably asking, "Well, just how do we help those Christians who see most as 'not one of us' do that"? No easy answers here. But maybe, as your post puts forth, it is a constant reminder of the good practiced by others. Indeed many, too many Christians are terrified of embracing someone they are "not supposed to embrace", and this keeps churches stunted and ineffective. But my prayer is that there are enough ministers out there who can enter these dens of fear and point to the good of others in such a wise and gentle way that it has people nodding a loving "yes" before they realize they just took a step into the darkness of pure faith. The more I hear from Pope Francis, the more genuinely impressed I am with him as a person, a Christian, and a spiritual leader. "Out beyond ideas of right and wrong, there is a field: I will meet you there." - Rumi. Hey Melanie, thanks for the comment. It's refreshing to hear that you don't have any ill will and that you're still searching and you have an open heart. Would you mind if I share a bit of my story? I've been Catholic my whole life, but in my late teens and early twenties I really fell away from my faith (though I would show up at mass on Sundays). Though when I was 21 I was kicked out of the USAF Academy for lying about a friend drinking, which totally through my future/career plans off. At this point 3 things really opened my eyes to a relationship with God: 1) intellectual blocks were removed as I started reading more about God and theology, 2) I realized the struggle I had between good and evil and the depth of my sin (and I experienced powerfully God's mercy in confession), and 3) I found acceptance and welcome and deep and lasting friendships with other Christians. Thanks for reading, I'd love to dialogue more if you're open to it. I would like to first say that I am a New York Yankee fan and Manchester city supporter. But, dammit! you have to buy a round for anybody, no matter what jersey they're wearing. Who cares if they don't buy a round for you.